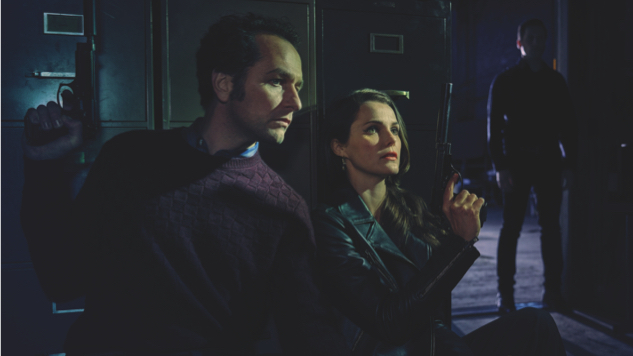 The Americans consistently tops year-end best-of lists, and for good reason: it delivers compelling characters, snappy writing and a suspenseful atmosphere. That’s why we’re here to recommend books you’ll enjoy if you’re enamored with the FX series. And if you haven’t given The Americans a chance yet, who knows? Maybe a couple of the books on this list will convince you to watch the critically-acclaimed show. For fans of: The marital dynamics on The Americans. Pavone’s book follows Kate Reed, a woman who has left her professional life behind and has settled into being an expat wife in Luxembourg. Kate and her husband, Dexter, are thrilled when they quickly become friends with another couple. But as Kate gets to know the new couple, she questions their supposed identities and wonders whether Dexter is being honest about his job. For fans of: The complex balancing act of being a spy on the show. Amberlough is set in a fictional world where a radical, socially conservative party called the Ospies is threatening to persecute anyone viewed as “different.” Master spy Cyril DePaul doesn’t agree with the Ospies, but he’s forced to turn double agent, informing on his own people. Will he be able to play both sides, protecting himself and those he loves? For fans of: The Americans’s Cold War setting. Exposure is as much a period piece of the 1960s as it is a character study centered on one character, Simon, who has been keeping a secret from his family. His best friend from school, Giles, works as a spy, and when Simon becomes entangled in Gilles’ world, everything he holds dear is threatened. This is a quiet novel, so it’s not one to pick up if you’re looking for an action-packed thriller. But it proves compelling and thought-provoking for those willing to give it a shot. For fans of: The secrets on top of secrets on top of secrets in the show. It’s World War II, and people’s morals are murky at best. Maddie and her friend Queenie undertake a desperate mission for the British that involves flying into Nazi-occupied France. But things go wrong, and Queenie is captured and tortured by the Nazis. Code Name Verity is written as her confession, and it’s brimming with betrayals and twists. For fans of: The Americans’ spy thriller genre. We know that le Carré penned more prominent spy thrillers than Call for the Dead, but we’re highlighting this novel because it’s his first book starring George Smiley. A career intelligence officer for the British, George Smiley is investigating the apparent suicide of a colleague suspected of being involved with the Communist Party. But nothing is as it seems in this novel from a master of the genre. For fans of: The Americans’ strong female characters. This graphic novel series stars Velvet Templeton, the unassuming young woman who serves as the personal secretary to the head of a spy agency. When one of its best agents is murdered, the evidence points to Velvet—and little do they know that Velvet is dangerous in her own right. Velvet is a modern classic, so if you haven’t delved much into the medium, this is a great place to start. For fans of: The thrill of the chase in the show. Klara, who was orphaned as a child, works as a political aide in Brussels—and she just saw something that could get her killed. The only person who might be able to save her? An old spy, who’s out of the game. He was once so devoted to spycraft that he abandoned his own baby daughter out of necessity, but now he’s a disillusioned man who has little left to live for. That is, until he hears about Klara and her desperate attempts to stay alive. For fans of: The conflict of identities in The Americans. The novel’s narrator is a communist double agent who has arrived in America after the Vietnam War. He’s building a new life in Los Angeles with fellow Vietnamese refugees—and reporting on them to his superiors back in Vietnam. If the morals and questions inherent in living a double life are ones that appeal to you, you should definitely pick up this compelling novel. For fans of: The Americans’ Russian characters. In 1922, Count Alexander Rostov is sentenced to house arrest in a hotel across the street from the Kremlin for being “an unrepentant aristocrat.” He watches world-changing events unfold from the prison of his hotel room over decades of Russin history. This novel has been praised for its exquisite detail, and it’ll surely bring Russian culture to life for you. For fans of: The kickass Russian spies on the show. We can’t in good conscience forget one of pop culture’s most famous fictional Russian spies: Natasha Romanov, Marvel’s Black Widow. This new comic run forces some of her darkest secrets into the public eye, leading Natasha to go on the run from S.H.I.E.L.D. and face her past—namely, the Red Room, a place that has come back to life in a frightening new incarnation.